I’ve had this blog for most of this school year, and I’ve learned so much through all of the whale research I have done. Whales have always been my favorite animal, but I never did any research on specific breeds, other than my third grade report, but none of that ever “sunk” into my brain. This blog has also changed my views on some things, like SeaWorld. 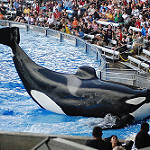 In all honesty, I thought SeaWorld was not too bad before, my obsession with whales made me okay, and frankly excited, when it came to watching my favorite animal perform live. However, now that I am aware of how poorly they are treated, my opinions have changed. I have also learned many interesting things, like how their brains work, what their “ocean songs” could mean, their love lives, and individual facts about each breed. In conclusion, this blog has been a great experience, because of all the new information I have found, making me more and more interested in the animal itself. A blue whale is a type of whale breed that belongs in the baleen family. These whales are the largest mammals that have ever lived on this planet. Males, being a little smaller than women are as long as 79 feet on average, while women on the other hand average about 81 feet. These whales can weigh up 420,000 pounds and live up 85 years. These whales are so massive that their tongues can weigh as much as an elephant, and their hearts can weigh more than an average car. Since these whales are so large, you would think they ate large sea creatures and fishes, however they feed on krill, which are shrimp-like animals that roam around in the ocean. Being so large can also be a disadvantage, many of these whales are involved in accidents that could have been prevented if they differed in size, for example, these whales are commonly known to get hit by large approaching ships. These whales are one of a kind, and are sadly endangered. Whales are often acknowledged for their popular “songs” that can be heard throughout the ocean. Have you ever wondered why they sang these beautiful songs? Some may think this is form of communication. I agree with this statement, but it also makes me question if they use songs to communicate romantically. Studies show that whales have a brain cell called the “spindle cell,” people thought these cells were found only human brains, but they were discovered in other mammals. These cells make animals/humans feel certain emotions. The whales that obtain these cells are sperm whales, blue whales, killer whales, and humpback whales. More research also shows that whale brains are very similar, if not better than human brains. So think twice when you think killing whales is okay, because for all we know, killing a whale can be similar to killing a human. Whales may feel the same emotions as us, which may cause them to go through great mourning and suffering caused by the death of a friend, or family member. These emotions may also be the cause of all the accidents at SeaWorld, due to the mammals feeling “enraged” by their current situation. In conclusion, whales being more similar to humans than expected, can also do things we do, like fall in love. Narwhals are often known as a mixture of a whale and a unicorn due to the horns on top of their heads. These whales are known as the “unicorn of the sea.” The reason why these narwhals are so popular is because of this song that was posted on YouTube. It became a video seen as entertainment for children and teenagers. Many people don’t even know narwhals exist, they may think these creatures are just “imaginary” since they look so similar to unicorns. These whales are found in the Arctic waters and usually travel in pods with 3 to 10 whales. A fact that is strange compared to other whales is that narwhals only have two teeth, one of these teeth are their “horns,” or tusks. Females, however, don’t grow these tusks, they often have a very small tusk or no tusk at all. These whales grow ranging from 13 to 20 feet and can weigh up to 1 and a half tons. Listen to the “Narwhal Song” here! Humpback whales are one of the most popular whales out there. They are known for their “ocean songs” which are those howls, and cries that you can hear when you’re whale watching. Humpback whales feed on things like shrimp, krill, plankton, or small fish. These whales are massive, they can vary from 48 to 63 ft (about the size of a bus), and can weigh up to 40 tons. Humpback whale’s lifespan vary from 45-50 years. An interesting fact about Humpback whales is that their “songs” can be heard from about 20 miles away, and usually last up to 20 minutes. These whales are in the same family as blue whales, fin whales, sei whales, and minke whales. Humpback whales are no where near extinct and can be found in oceanic waters all over the world. These whales are powerful swimmers, and can swim up to 10,000 miles a year, making almost a round trip all over the world. Humpback whales are famous, and can be spotted frequently, just listen for those famous songs next time you’re in the ocean! Beluga whales are known for their color, which is white. Something you might have not known is, beluga whales aren’t born white, they are usually a greyish color or brown. Beluga whales are about 13 to 20 feet in length. Similarly to other sea creatures, beluga whales live and travel in pods, which are small groups. These whales feed on crustaceans, fishes, and worms. Beluga whales don’t have dorsal fins and their foreheads are larger than normal. They’re pretty high in population, hundred of thousands roam around in the arctic oceans today! Beluga whales don’t live as long as other animals, such as sea turtles, they live up to 50 years on average. Fun fact about beluga whales, they have vertebrates that aren’t fused so they can turn their head in all directions! Going back to SeaWorld, this article will explain many reasons why the whales at this location are NOT being treated correctly. This article is called “‘This is not right’ Former SeaWorld trainers recall killer whale treatment”, it discusses the way whales are treated in SeaWorld. This article states that not just whales, but other animals in SeaWorld were being affected by having chlorine-infested tanks, cramped environments, and sunburns. It tells us that the tanks are filled with too much chlorine, which might cause the animals to get arthritis, or too become permanently blind. Many people blame the whales for being aggressive towards human, however they are doing this out of frustration. The whales eventually become frustrated since they have to remain in a cramped and unsafe tank. The environment might not be the worst cause of the frustrations, some whales start to feel distressed since they are forced to leave their mothers back in the ocean. This is just a small portion of the problem, there are many other reasons why having whales, or any other other animal, being trapped in cages is extremely harmful. SeaWorld is a harmful place for whales. They are caged into large tanks and are forced to learn how to do tricks. Orca whales that have been captured, and sent to SeaWorld, are known to have shorter lives. They have the potential to live 70 years longer than do when living in SeaWorld. If failed to capture, people usually kill the whale. Whales are also forced to breed with other whales, and when it doesn’t work out, the workers physically get the sperm out of the whale. The whales are forced to be exposed to sunlight daily. They can’t go into the water deep enough to avoid sun rays. Whales, just like humans, can get sun-burnt. SeaWorld claims to take amazing care of their animals, but when their whales get sun-burnt, they simply cover up the burns with black-zinc oxide. Whales are suppose to be able to swim hundreds to thousands of miles a day, but at SeaWorld, their numbers are more limited. It is healthy for a whale to be able to explore areas, but at this park, they are trapped in a tank with nowhere to go. This Shamu Show was continued for many, many years. Finally, people took a stand, SeaWorlds are now discontinuing Shamu Shows due to the harsh living conditions the whales have to face daily at SeaWorld.